The Manchu people were descended from the Jurchens. They spoke a language probably closely related to Turkic and Mongolian. When the Turkic and Mongolian people slowly took over most of Asia, eastern Europe, and North Africa from the Indo-Europeans in the course of the 1200s to the 1600s AD, the Manchu were part of that expansion. During the late 1500s and the early 1600s, the Manchu got stronger and more united. Between 1627 and 1636, the Manchu defeated Korea. They forced the Koreans to pay tribute to them for many years. In 1644, the Manchu invaded China. They conquered the weak Ming Dynasty and began to rule China for themselves as the Qing Dynasty. 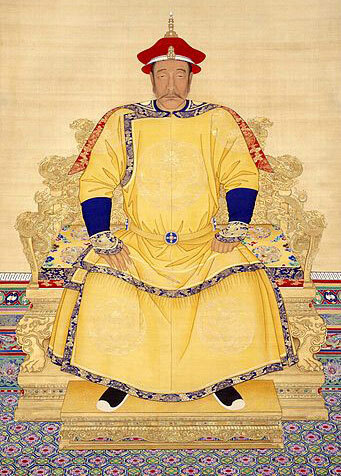 Early Manchu emperors married women who were descended from Genghis Khan and Kublai Khan, in order to seem like they were re-creating the powerful Mongol Empire. But really the Manchu just ruled China. Gradually the Indo-Europeans and the Han Chinese people started pushing back against the Turkic and Altaic expansion. During the 1700s and 1800s, the Russians, who were Indo-Europeans, gradually extended their empire eastward across Central Asia. They eventually pushed the Manchu into a smaller area. At the same time, European ships began to arrive along the Pacific coast of China. They threatened the Manchu from the east. And at the beginning of the 1900s, the Han people revolted against the Qing Dynasty and established the People’s Republic of China, again seizing power from the Manchu. Most Manchu people stayed in China and did not move north into Russia, but many Manchu were afraid that Han people would hurt them, and pretended to be Han people during the 1900s. Recently, more Manchu people in China have decided to come out of hiding, and even some Han people in China have gotten interested in Manchu culture. Cite this page: Carr, K.E. Who were the Manchu? Central Asian History. Quatr.us Study Guides, May 30, 2017. Web. April 22, 2019.